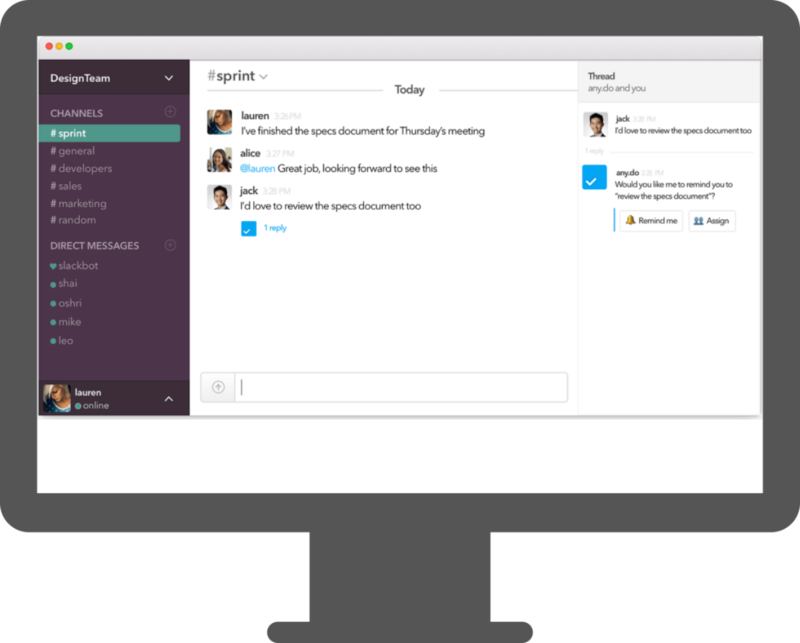 Say hello to the Any.do’s Slack bot! It is a chat-bot which helps you manage your Slack tasks by allowing you to add reminders, assign tasks to other team members, and have a full display of upcoming tasks. And the best thing about the Bot is that it is able to detect tasks before you even add them! The Bot will scan your conversations for any potential tasks and offer you to set a reminder or assign the task to another colleague, while you are still chatting. The bot will also display a daily agenda for each morning, so you never fall behind on your tasks. To start chatting with the bot: Click “Any.do” under the Direct Message section of your sidebar. If you haven’t yet linked your Any.do account to the Slack Bot, you will receive a message directing you to a login page. To add reminders, assign tasks, or complete tasks: Ask the bot to read your daily tasks, and then you’ll be given options to assign, complete, or add reminders to tasks.